Sister city diplomacy produced a rare win for Taiwan this month. 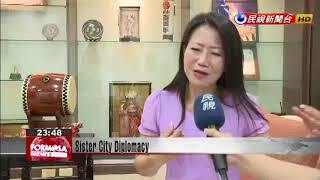 Delegates from Kaohsiung went to Japan to visit their sister city of Hachioji. While there, the Kaohsiung delegation joined other international groups in parades, where they identified themselves as being from "Taiwan." The trip comes amid a national campaign to be recognized by the name "Taiwan" at the Tokyo Olympics. This banner carried in a parade in Hachioji, Japan reads "Visiting Delegation of Kaohsiung, Taiwan." The name "Taiwan" appeared in all Japanese media reports about Kaohsiung City's participation in the event. We have been feeling the political pressure at home and so when we come to another country and the people recognize our national identity without any reservations, it is truly moving. At the Akita lantern festival, Japanese organizers had - on their own initiative - given the Kaohsiung visitors a banner identifying them as being from "Kaohsiung, Taiwan." The Akita lantern festival attracts 1.3 million visitors from around the world. We were the only international delegation to enter with the governor. As our delegation marched by, event organizers identified us as coming from Taiwan on their broadcasting system. All around us, there was jubilant cheering. Kaohsiung has built up a network of 32 international sister-cities and every one of them has the word Taiwan in their official documentation. No matter the difficulties faced by the nation on the diplomatic front, metropolitan diplomacy forms lasting bonds with the people of all nations and promotes real bilateral exchanges.